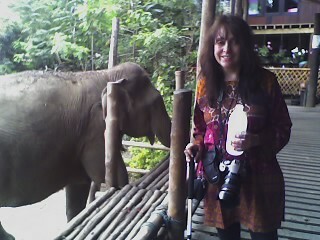 Here I am with Diana taking the phone cam pix at the Elephant Nature center. UNREAL you guys. See the other posts from today to read much more about our experience. This ellie was standing at the platform deck waiting for a hand out along with 30 plus other beauties today. All rescued from terrible fates in the logging industry or performing and begging duties. I too was very moved by your elephant story, so amazing!! I am so glad this place is doing such wonderful things for these majestic creatures. Sandy I am laughing, I have that same shirt in the elephant photo! Too funny! Hi Elise and Cathy!!! oh how funny Cathy…great fashion minds think alike!!! Those shirts I got from SariSari have been fantastic and wash/dry so fast!!! …Am so happy to find your fantastic blog!! What an amazing day, amazing elephants and amazing people!! We both can’t wait to seee some more elephant photographs and hope all the publicity they receive helps thoise beautiful gentle giants in their plight to survival and freedom. We would be forever grateful if you managed to get a pic of me being kissed by ‘HOPE’ …what a charmer! !…to show my class at school!!! WOW! What an experience!! !